Comments: Elon Musk’s book has a compelling narrative, a great inherent story and is very well written. It is not for everyone. 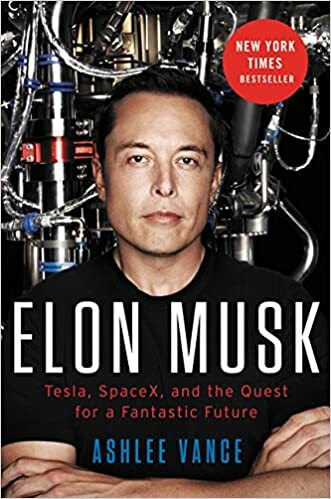 However, if you are interested/intrigued by Elon Musk and/or have an interest in entrepreneurship, space or clean energy, this is a fascinating read. 1. I found it fascinating to see how Musk kept buying himself career credit to do the next thing. His first tech company was a internet 1.0 version of Yelp meets Google Maps that exited for >$300M. This, then, gave him capital and credibility to work on X.com, which became PayPal. That, in turn, led to SpaceX.. And he chanced on Tesla because he was known to care a lot about clean energy. 2. Elon is a suitably weird/crazy, gifted person whose drive matches his considerable intellect. That said, he’s had to make some really big sacrifices to get to where he’s gotten to. He sees his mission as one that will save human kind (we care a lot about legacy as human beings) and his skills and experiences have positioned him beautifully for it. It isn’t for everyone. But, it is nevertheless inspiring to see him work toward what matters to him – even if his style occasionally is occasionally cold and un-empathetic. 3. I love Elon’s focus on first principles. His desire to understand the key drivers is phenomenal. The way he disaggregated the cost of a rocket’s components to get to understanding how over priced rockets are was, again, awe-inspiring.